This publication is a photographic record of all the places that Fryderyk Chopin visited in Europe. 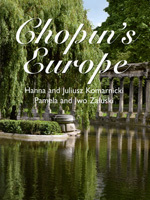 Hanna and Juliusz Komarnickis' highly evocative and personal photographs, as well as the interesting text by critically acclaimed Chopin biographers Iwo and Pamela Zaluski, tells the story of the great composer's travels all over Europe. This innovative format brings to life the varying beauties, moods and aspects of his Continent, from Zelazowa Wola, through the wild, rugged beauties of Majorca to the Highlands of Scotland, places in which he lived, loved and composed his memorable masterpieces. The text is complemented with quotations from correspondence and musical excerpts. The foreword is by Martha Argerich, one of the greatest Chopin interpreters of her generation.